Three hoodoos in Devils Garden near the Hole in the Rock road in Grand Staircase Escalante National Monument illuminated by the last light of the day. 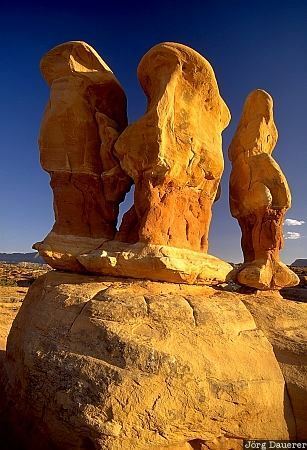 Grand Staircase Escalante National Monument is in southern Utah in the western part of the United States. This photo was taken in the evening of a sunny day in May 2002.